At Extreme SEO, everything starts from Extreme. Our highly qualified team is a combination of expert SEO analysts, strategists and e-Marketers alike. We love to brainstorm new strategies, ideas and concepts and execute them with perfection and full customization into our clients' websites. We maintain proper communication with our clients at all times, to ensure clear and unified business objectives. Extreme SEO is proud to have 47 In-house staff that comprises the best and brightest minds in the eMarketing Industry. Belonging to different spheres of life, they all bring diverse experiences to our humble team. 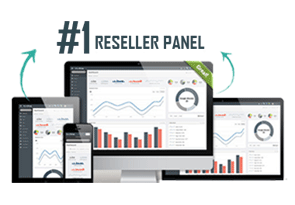 Our reseller base has been constantly growing since 2008. Today, we have around 900+ Active Resellers and the number is ever increasing. Our sellers take care of marketing, while the rest is maintained by our company. When it comes to Internet Marketing, there is no one-click-solution for everything. Creating significant conversations and customer engagement around your brand calls for strategies that are custom made to your website and the requirements of your target audience. We know where to draw the line between Online Marketing and Offline Marketing. Whether it is optimizing web pages to boost the ranking of your keywords or drive organic traffic, increase conversion or develop content –our team knows no boundaries. We guarantee the success of your business. 52+ more Advanced On page SEO Tasks will be performed by a Certified SEO Consultant. All our Backlinks Generated from 100% Organic, Google Recommended Link Sources Only. Dedicated Social Media Brand Manager available for our Enterprise Social media Management Campaigns. Extreme SEO has done a great job. They say that it can take 3-6 months to see results, but I started seeing results in the first month. Very happy and will continue to use them for my off-page SEO work. Millions of companies redesign their websites every year, often times with the help of marketing agencies. whether redesigning your own site, or working on a client project, here's a fill-in-the-blank workbook to ease the pain of your next redesign. This interactive Excel workbook helps you stay organized, and ultimately save time. Read more.. 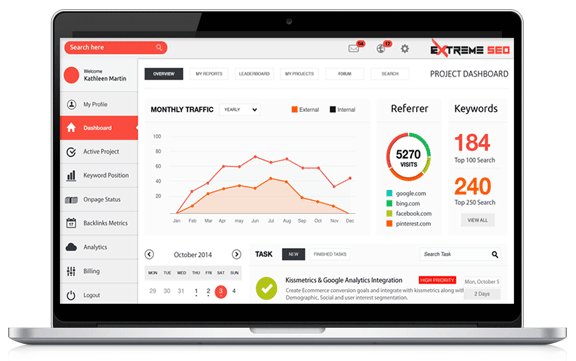 The Extreme SEO Project Management Dashboard is available on the Cloud i.e., you can access your live project from any device with an Internet Connection. Review the invoice of your project and pay the bills with a single click. The aim of our Project Management Dashboard is to express the project status in a short yet effective manner. It is a real savior for clients who want to keep an eye on the status of their online campaigns. Launch your online campaign today and stay updated with us! Our unique strategies and ideas will give your website an edge over the competition and help you in retaining customers. We will give your brand an online presence that’s easy to spot and impossible to ignore.
" 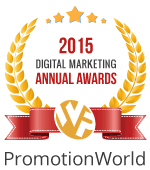 Complete Digital Marketing Solution for Your Brand"
Search Engine Optimization is not how it used to be back in 2010. In the present day, Google is constantly fidgeting with its organic search algorithms and penalizing websites for following the wrong SEO measures. As a SEO certified company, we are confident in our skill-set in eMarketing, while our SEO analysts keep themselves updated with the ever-changing Google Rulebook. SEO is not a cost, but an Investment. Entrusting us with your website will not only open doors to the most ground breaking strategies that evolve in the minds of our experts, but it will also ensure that your precious website is in the right hands. We are sure to provide massive returns against your modest investment in SEO. The sincere goal of Extreme SEO is to research and devise the single most powerful custom-made strategy that is bound to boost the visibility of your business and convert traffic to consumers. We help clients build the right infrastructure, mix and blueprint, and then guide them towards effectively implementing the most cost-effective and high ROI strategies that are parallel to their primary business objectives. Take an initiative now and see your website grow! At Extreme SEO we aim to deliver best tracking and Return on Investment for the social efforts of our clients. Our experts make full use of the dynamic social media landscape and create social media campaigns for your business that will not only give your website the reachability (it truly needs) but also convert followers into potential customers. We all know the importance of word of mouth in converting sales; Social Media serves as a word of mouth for your brand (literally). Present-day, it is important to join online conversations about your niche and find out from the consumers directly what they want and what they expect from your brand. This is where Social Media Management comes in. We truly care about the reputation of our clients and give their campaigns the same respect we would give our own campaigns. We consider the business of our clients as our own in order to have a unified objective and drive for the success of the business. With our Online Reputation Management Services you can re-establish a respectable online presence amongst your target traffic. We will help you build the perfect brand image your business needs. With our transparent services clients can monitor the ranking of their website on 15 different websites. We also formulate strategies and educate our clients on how to retain the obtained rankings for a longer period of time. No matter what the problem of your business is, we will always come up with good solutions.Whether you're a doctor trying to protect your practice from negative reviews, a parent trying to keep your children safe online, or a job hunter trying to make a good impression with hiring managers, it is imperative that you focus on protecting your online reputation. For many, that means turning to an expert consultant for full-fledged online reputation management services. Conversion Rate Optimization is arguable the most overlooked aspect of e Marketing. This is our most important tool for boosting the reachability of your business. At Extreme SEO we not only focus on the mandatory SEO optimization but also focus on Conversion Rate Optimization. After all your business doesn't just need organic traffic,it needs to convert that organic traffic into customers. We devise strategies for our client’s websites such that they are not only able to boost the traffic of their website but also retain it. We focus on diffusing quality content into your website so that visitors spend more time at your website. Our research team will study the major flaws of your business and find out what are the repelling factors of your website that have a negative impact on the Conversion Rates. One cannot simply speculate which changes to the webpages will attract a higher conversion rate. The experts at Extreme-SEO develop and test effective hypotheses, run meticulous tests and gauge results to zero in on the improvements. Example: A website designer cannot simply conjure an aesthetically appealing website which will take your visitors by fancy. Structured and organic process artistically applies learning from countless results to test only the best variants for your website. 95% of the people who visit your website for the first time do not buy anything. However, if you want to retain customers by starting a price war, always remember that there are companies that can afford to make lesser profits than you and survive. Hence, this idea will not take you very far. Ecommerce Marketing is not just product endorsement, it is the earnest bond that develops between consumers and online marketers. At Extreme SEO, we provide our clients the tools required to develop this bond. We help you find and retain customers, while ensuring repeat traffic and sales. With our specific set of tools at your disposal, learn how to calculate revenue generation, personalize email marketing improve conversion ratio and attract new and potential customers.We know the importance of older trends like mobile ads, paid ads and personalized marketing automation and newer trends like wearable technology, speedy delivery and brand identity.We discuss the most important eCommerce marketing trends with our clients and show them what will best suit the needs of their business. Inbound Marketing is creating products that people would like and sharing it with the world. It is important to create products that are unique and capable of self-advertising. However, creating a unique product is useless, unless you find the right time and place to sell it and make a profit. Inbound marketing helps you reach out to potential customers at the right moment, enhancing your product’s visibility. If your product is target oriented, it is automatically easier to sell. Hence, focusing on products that cater to the needs of target customers should be a priority. Our team of professionals at Extreme SEO helps you promote and market your product, generating optimum revenue in the process. We are up-to-date with the latest philosophies of Inbound Marketing and work to empower our clients to attract potential customers and convert inquisition into sales. Marketing is as much an art, as it is science. Hence, marketers need to focus simultaneously on multiple aspects. We help our clients to identify a target market and design products exclusively for the people involved. We believe in high quality conversation and help our clients generate introductory and follow-up conversation. Our Partner program is suitable for professional marketers, keynote speakers, trainers or even sales executives who need additional income to increase their revenue pipeline. Become our SEO Partner and add premium value to your existing services by reselling our result oriented and deep rooted Digital marketing strategies to your clients, which will keep them a step ahead of their competition and boost their sales conversions like never before.